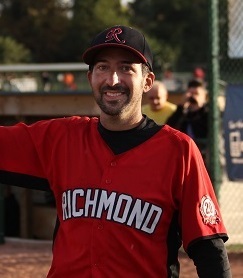 Dave joined Richmond in 2012 and immediately took on the co-manager role for the Dukes. In 2016, he moved to co-manage the Dragons and also Presidency of the club. Last season with the Dragons he finished with a .455 Avg, including 21 RBI's in 55 AB's. Per joined the club as a rookie in 2005 not only to Richmond but to baseball as a whole. Along with Co-managing the Dragons, he is also the Secretary for the club. Per finished with an impressive .522 Avg last year with the Dragons, with 9 RBI's in 23 AB's. The Dragons are the club’s second team and compete in the AA South B division. Dragons’ players all have previous playing experience and are expected to play competitive and fundamental baseball. The Dragons can also offer the ideal environment for players wanting to develop new positional skills in a competitive environment. The Dragons play a mixture of double and single header fixtures throughout the season. In 2017 the Dragons had a combined batting avg. of 371. with 298 runs scored in 21 games.